In 336 densely packed pages and over several chapters, Packer, in his book, A Quest for Godliness, brings the reader face to face with many different facets of Puritan life and ministry with historical precision and keen theological insight. Packer insists that an encounter like this with the Puritans is essential for Christians today who have all but lost any true sense of what Puritans believed, lived for, and sought to give to the church. In an introductory chapter, Packer explains why we need the Puritans; his reason is clear and unmistakable. “The answer, in one word, is maturity. Maturity is a compound of wisdom, goodwill, resilience, and creativity. The Puritans exemplified maturity; we don’t. We are spiritual dwarfs” (22). In an earlier chapter, Packer compares the Puritans to giant Redwoods. To some, this description of the Puritans sounds exaggerated and contrived; a depiction not even close to the original. This is not surprising. The word ‘Puritan’ was originally coined as a smear word implying, “peevishness, censoriousness, conceit, and a measure of hypocrisy…it’s primary reference…was…to what was seen as odd, furious, and ugly form of Protestant religion” (21). Many of the word’s negative connotations have endured and hardened a prejudice toward the Puritans in much of the Western world. Fortunately, at the time that Packer wrote this book (1990), scholars, for the past half-century, had already begun to unearth the lost and forgotten treasures of Puritanism, while “meticulously wiping away the mud” from the original portrait. Since then, much ground has been regained in Puritan studies, and we now have a host of resources to which we can turn for insight into what the Puritans were really like. Nevertheless, I think Packer’s book is still very important, despite the recent growth in Puritan literature. For one, Packer writes from the burden to demonstrate why we need the Puritans. Although it is wonderful to have Puritan resources at our fingertips and in abundance, it is equally important to understand why we should make it a priority to study them. Packer’s explanation of why we should dig deep into the Puritans in chapters one and two of this book should be required reading for Christians of all walks of life. The remainder of the book is devoted to exploring five different aspects of these godly people we call the Puritans. Packer examines, in three chapters a piece, the Puritans and the Bible, the Puritans and the gospel, the Puritans and the Holy Spirit, and the Puritan Christian life, and the Puritans in ministry. Within the section on the Puritans and the gospel, one will find Packer’s famous essay from his introduction to John Owen’s Death of Death in the Death of Christ. Packer’s heart-felt and rigorous defense of Calvinism and it’s inexorable relation to the gospel is worth the price of this book alone. A fair and thorough reading of the section on the Puritan Christian life would probably help to dislodge our misconceptions about the so-called ridged formality and prudishness of the Puritans. Far from dull and unloving, the Puritans were those who cared deeply for the physical and spiritual well-being of their families, who sought to live all of life with great passion (not merely passion as a feeling, but passion for Christ), who desired to work with diligence and excellence in their calling, and who treasured marital devotion and fidelity. That is not to give the impression that the Puritans were flawless and worthy of emulation in every respect. They had their faults, and Packer deals with several of these squarely and with grace. But, in their case, the good far outweighs the bad, and their example in a multitude of areas should be admired and followed. Packer’s book, overall, is excellent. His careful choice of words to describe the Puritans (“sweet, peaceful, patient, obedient, and hopeful,” is just one edifying string of adjectives) and his insight into what makes the Puritans a valuable model for Christians today are only two of the many reasons why I thoroughly enjoyed this book. One weakness I did perceive (and this is minor), is the lack of chapter to chapter coherence in some cases. 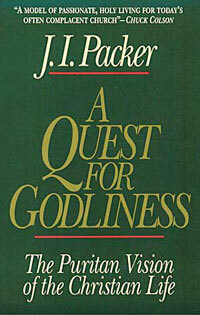 A Quest for Godliness is not a book that Packer sat down and wrote from start to finish. Rather, it is a collection of essays on the Puritans previously written by Packer that have been tied together by a some introductory chapters and an identifiable theme. This, however, is only a small weakness, if one could call it a weakness. Regardless, Packer’s book is definitely one that is worthy of close attention; not for the sake of raw information and an educated historical perspective, but for the good of our souls, as we learn from a group of men and women who walked near to God. i have this book in a ‘soon to be read’ pile of my bookshelf. can’t wait to read it and learn from dr. packer once again. Good book! Nice review as well. It was required reading at TMS back in the day of ’89. Good to hear from you. Apparently I am a little behind on my book reviews. I’m not exactly on the cutting edge – in books or in methods of note-keeping!